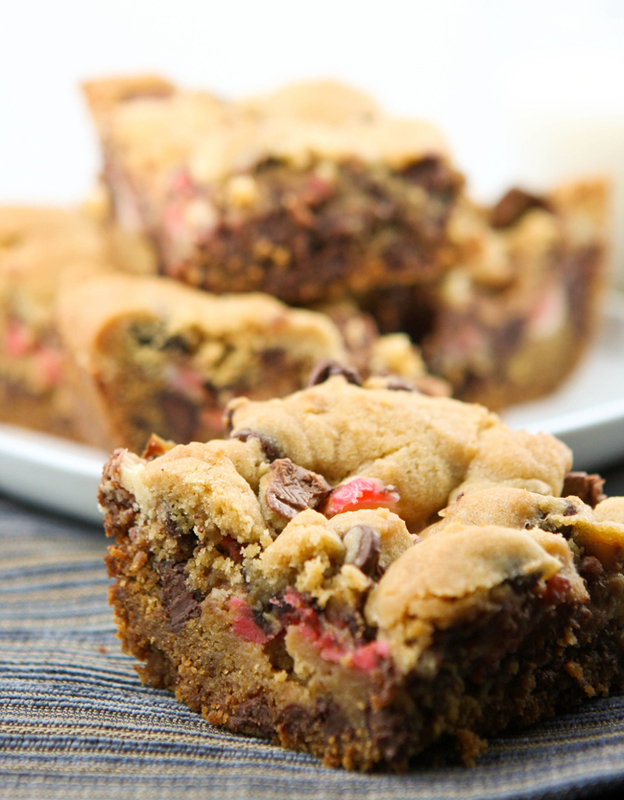 Cream Cheese Candy Bar Blondies Recipe — Pip and Ebby - easy, delicious recipes! A perfect marriage of chewy cookie, candy bar crunch and cream cheese. It’s sweet and a little salty at the same time. A delicious dessert for any occasion... or time of night!! I have been in a major funk this week. Sometimes I still feel the aftershocks of 2011, the year that shook me up. I think that's what I'm feeling this week. We put Elijah's 8th heart cath on the calendar, and that always puts me into a bit of a tailspin, too. Here's hoping for a better day tomorrow! When I am feeling blue, food doesn't sound wonderful to me. Except for sweets, that is! No matter what is going on in my life, I can always muster up an appetite for dessert. I thought up this recipe, yes, at 3:00 in the morning, and Dan and I both loved it. We ate the entire pan by ourselves. That is always a sure sign of deliciousness. Preheat your oven to 350 degrees F. Spray an 8x8-inch baking dish with cooking spray and set aside. Using a hand-held mixer, beat on medium speed for 1 minute. Add 1 egg and 2 teaspoons of vanilla extract. Beat until creamy. Add the flour mixture in batches until just incorporated. Stir in 1 cup of semi-sweet chocolate chips until combined. Coarsely chop 12 fun-size Twix candy bars. Soften 4 ounces of cream cheese in the microwave. Divide it up, if desired, and color with food coloring according to a particular holiday or celebration. Press three quarters of the cookie dough into the bottom of the prepared pan. Bake in the preheated oven for 20 minutes. Drop the cream cheese in spoonfuls over the brownies. Use a butter knife or the back of a spoon to spread the cream cheese around without covering the entire surface. Sprinkle the chopped Twix candy bars over top. Place the remaining cookie dough over top, in crumbles. Place the baking dish back into the oven and bake for an additional 20 minutes. Let cool completely before cutting into squares. Wishing you all happiness this weekend! Cream cheese + candy bars + brownies = TOTALLY irresistible! Preheat oven to 350 degrees F. Spray an 8x8-inch baking dish with cooking spray; set aside. In a medium bowl, combine flour, baking soda and salt; set aside. In a large bowl, combine brown sugar and butter. Using a hand-held mixer, beat on medium speed for 1 minute. Add egg and vanilla and beat until creamy. Add flour mixture in batches just until incorporated. Stir in the chocolate chips with a spoon until combined. Press three quarters of the mixture into the bottom of the prepared pan. Bake in preheated oven for 20 minutes. Add spoonfuls of the softened cream cheese onto the top of the brownies. Use a knife to spread the cream cheese around without covering the entire surface. Sprinkle the chopped Twix candy bars over top. Place the remaining dough over top in crumbles. Put dish back in the oven and bake for 20 additional minutes. Let cool completely before cutting into squares.